Leave it to Rebel to come out with a new frog this year called the Rebel Frog-R. There is something to be said about fishing topwater frogs, and one that cost under $5 is awesome in my opinion. From what I have read, this lure has spook type side to side action if you work the rod tip. I am looking forward to fishing this lure. These lures are 2 inches long and weigh 3/8oz. They come in four different colors, Swamp Frog, Leapord frog, Cricket Frog, and Bull Frog. 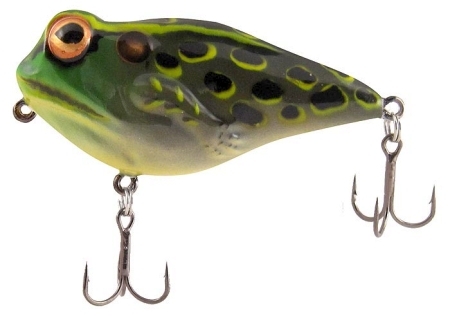 The picture below is the Bull frog color. Check them out here.